A very nice price point for a very reliable 7mm Remington Magnum round that is built for general hunting use but is effective for more than just that. This is about as plain vanilla a round as you can find for the 7mm Rem Mag, but it is still a potent performer. Offering excellent ballistics on target and with the lighter weight projectile, extreme versatility out of a belted Magnum cartridge. This is a great deer, elk or moose cartridge. The power of the Magnum cartridge is slightly muted by the smaller grain weight projectile, but that doesn’t take away the versatility of the round and it will be enough for bigger game, and not too much for larger intermediate game. Either way, for the game listed this is a “dead where they stand” type of cartridge. The Federal Power-Shok soft pointed projectile has been a potent performer for more years than most brands have been alive. The fact that it is still a viable technology so many years after its introduction proves its value. This is a 150 grain soft point projectile that is suitable for general hunting purposes, but can also be used for target and other general range and scope adjustment work. The accuracy of this round is about 1.5MOA or better. 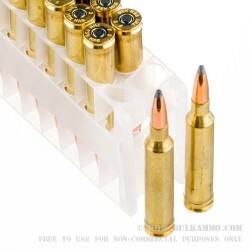 The Brass casing features a Boxer primer for easy reloading. Q: Will the price of this remain relatively flat over the next 2-3 years? I don't know too many people who have or use 7MM Magnums in my area of the US, so I would think there would be less demand. Just trying to plan out a long term budget, thanks. A: It is difficult to predict the price of ammunition. While it might seem that low demand would lead to lower prices, if demand drops too much, it is no longer cost effective for manufacturers to produce the ammunition, and then supply ends up becoming low in relation to demand, which, of course, leads to higher prices. Beyond that, raw materials costs and large contracts for other types of ammunition have more of an effect on the cost of ammunition as a whole than the demand for one specific caliber. 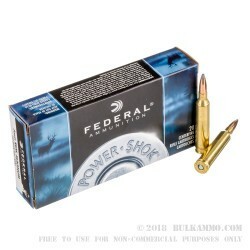 You will notice that calibers that offer similar case sizes, powder charges and projectile weights to 7mm Remington Magnum are priced at approximately the same amount.